Home / Sequel Trilogy / Episode 8 / Is this the Episode 8 title? Does it reveal too much? Star Wars fandom is buzzing today over a potential title leak for Star Wars Episode 8. An understandably bitter employee is speculated to be behind the leak. It’s said they acted out after realising they were assigned to set up signage for Star Wars Celebration Europe at the ExCeL Exhibition Centre, a near two full months before the Convention is set to commence. Word has it that Star Wars Celebration management’s attempts to fire the leak-posting employee have proved futile over the louder-than-normal ambient noise at the ExCeL Exhibition Centre. A double debate has engulfed the Star Wars online community, with fans not only pondering if the leak is legit, but also if the potential title reveals too much about the plot of the film. 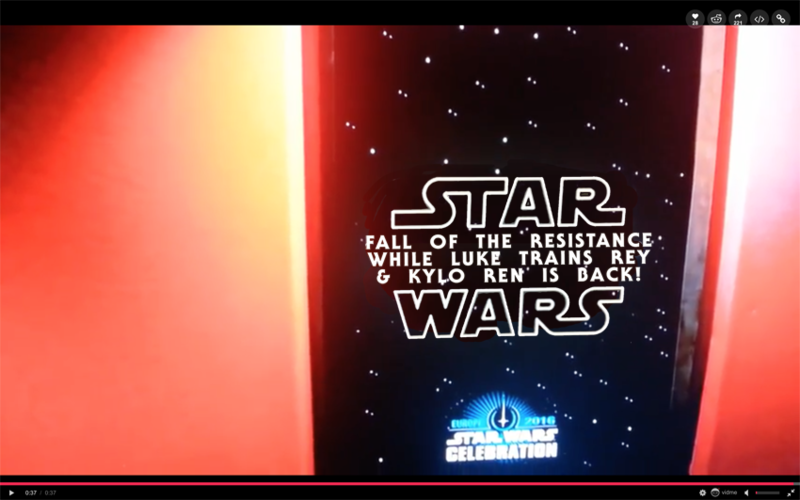 “Fall Of The Resistance While Luke Trains Rey & Kylo Ren Is Back! I mean who doesn’t want to see that? Perfect marketing. It’s a brilliant title!” said one fan. Will this strangely lit, door frame looking thing prove to be reliable? Only time will tell.